I’m about to reveal to you the greatest set of drums I’ve ever played. Without a doubt I know these drums will “blow away” any other drum kit out there. Don’t even try to change my mind on this, because I’ve played every kind of set of drums made in the world. All of the greatest drummers play them too. OK,,, READY? !,,, The best drums ever are $#@!#!#@#!$. What!,,, you say you couldn’t hear me. I said, $#@!#@!$#@!$#. They really are amazing. You must get them or you’re just not the most hip, cool, “up to date”, stylin’ cat out there; like all of the other really happenin’ drummers who play these drums. OK, OK, STOP!!! For those of you that know me, you know I don’t get into these kinds of discussions. There is no “greatest drum set ever.” I’ve even worked in several drum shops through the years, and this was always part of the common shoptalk. “Oh, man, you should really get these!” or “What!,,, you’ve never played those drums? They’re the best! You’re really missing it, dude.” It didn’t take long for me to realize that the art of drumming is much more than what drum set you play. My favorite equipment recommendation is to play what you love and what inspires you. It doesn’t matter if it’s Yamaha, Pearl, Tama, DW, Gretsch, or any of the other great drums out there. Play the drums that make you want to play! When you play “that” drum kit then you’ve found YOUR instrument. And don’t let anyone “mess with your head” about it. What makes drums sound great is a great player making great music with a great team when everything technically comes together. Now that can be a very complicated thing, but let’s stay focused on the drum issue. We could also talk about cymbals, sticks, drumheads, etc. etc., but again, we will stay in drum world for this article. In all drum making, even with custom-built drums, there are some elements that apply to everyone. I know there are a thousand variations in the small details, but we’ll focus on the big issues. Types of wood, the sizes, the rims, and the tom mounting system of the kit are probably the biggest factors of drum sound. And this isn’t even discussing the electronic and engineering options. Maple in general is a very hard wood, but it is also very resonant. I don’t know all of the technical reasons, but they are “punchy” and have a lot of tone. In some settings maple drums can be a little too big sounding. I’ve heard some people say the sound spreads out too much, and that they keep ringing too long. So if you want a more focused, tight sound maybe you should try birch or other drums. Birch drums, like the classic “Yamaha Recording Custom” series, are amazing too. These drums were the early sound of Steve Gadd, Dave Weckl, Paul Leim and others. They have a little more mid-range in tone and have a little tighter punch. Now, does that mean better? … No, it’s just different. Especially when it comes to the sound of the toms. Many players like Gadd and Leim are using maple kick drums with birch toms. This would give you a huge, fat sounding kick, with toms that are a little more punchy in the mid range. All the drum companies would advertise and price their maple & birch kits as the top of the line drums. Beyond that they would start to use other types of wood, and combinations of them. Perhaps combining these popular woods with mahogany or oak or others. If you are reading drum magazines and catalogs you probably find the variations pretty overwhelming. But honestly, what I’ve observed is that when you get into the less expensive drums they all sound more controlled and not as resonant. Which is not necessarily a bad thing. In some settings you don’t what the drums to sound so huge. If you play in smaller venues all of the time, a less resonant kit might work better. 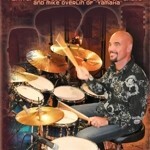 I’ve used Yamaha Oak drums or other inexpensive kits that sounded awesome, but they just didn’t sound as big. The key in most settings is tuning and head selection, which I’ve written about in other articles. You could really put together whatever kind of drum kit you could imagine with the current list of options that are available. Although I personally like to hear a drum kit with the same tonal characteristics across all of the drums. Of course next week I could change my mind. Remember, this is art! Besides types of wood, there are also variations in size and thickness of shell we could choose from. Deeper drums will sound fatter and maybe darker. Shorter drums will be punchier. Thinner shells will sound brighter than thicker shells and so on. If the drums have die cast hoops rather than machined steel they will probably have more of a snap or cutting sound. The best way to tune your ear to these variations in sound is to go to a shop and try a lot of different drums. Don’t be a pest, but ask the store sales people if you can take some time to try things out. Try out everything and take mental note of what make & model your playing. Be sensitive to the workers and customers and try to do your testing in minutes and not hours of playing in a store. I think you’ll get excited as you discover what sounds inspire you. It’s amazing to play drums and feel that connection to a sound. Always keep in mind what you’ll be using the kit for. Are you recording? Are you playing in mostly large rooms or small? Is the music more rock, pop, jazz, or is it a combination of everything. Of course you may feel you need more options, but you don’t have the budget or space to own several sets of drums. So how can you pick out a kit that will work for everything? In general the standard kit I mentioned earlier really does cover all of the bases. It’s a big investment up front, but it will last a lifetime if you take care of it. If I’m playing in smaller venues I might only use the three smaller toms, use a smaller snare, and put more padding in the kick. When I don’t have to worry about the room I use everything and let them ring. I muffle as little as possible most of the time. Drums have a voice and I like to let them speak. Again this is always subject to what the job calls for. No matter what type of kit I use I look for the tom mountings to be some kind of suspension system. Even on a cheap kit this can make all the difference in the resonance of the toms and how easily they will tune. Mountings that attach to the shell or go through the shell will usually distort the sound or choke them. Quite often I can’t get the drums to tune properly and one or all of the toms don’t “speak” or resonate well. Unless you want that old school tom sound you have to have isolation mounting for the toms. This feature has become very standardized in modern drum building and can be found on even the cheapest of drum sets. I hope this helps keep your mind at ease if you’ve been wondering if your drums aren’t the “best drums in the world.” Or maybe this will help you in your journey if you have been thinking of a change in kits. Again, test a lot of drums and get your ears tuned in to what’s out there. You might just add some pieces. Maybe smaller toms or a smaller kick drum would be a good idea in a small room. It could be that a cheaper, less resonant kit is more suitable to your situation. Buying a really loud, top of the line kit and putting a lot of muffling on everything is a terrible waste of money. If you would like to, let me know how it’s going in your journey in discovering the sound of drums. You can write to my e-mail or the FAQ section at this web site. Happy drum hunting! Oh, and remember, don’t worry about finding the best drums in the world. I think they’re in heaven with Buddy Rich. Ha!!!!!!!! It’s so helpful to know the classic drum rudiments. I use them all the time for exercises & warm-ups. You can find them in most drum method books, and now on-line at many drum web sites. 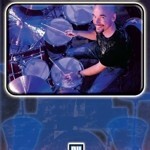 (*Download a pdf file for free at – http://www.pas.org/Learn/Rudiments.aspx )The rudiments are really the drummers alphabet. When you know them & build upon the concepts you will really expand your drum vocabulary. Finding the right cymbals for your style of playing can be one of the most challenging and frustrating tasks for a drummer. With so many options you might feel like it’s trying to find your favorite tree in the forest. You end up with that feeling of being totally lost in the woods. Well come along with me and let’s go cymbal hunting. I’ve walked this trail before. Let’s first decide what you want to accomplish. Do you need cymbals for a heavy rock band or a jazz trio? Is your style more latin or classical? Or maybe you just want a great “all-purpose” set of cymbals to do everything. I would definitely recommend having a set of cymbals that will cover all the bases. Don’t think of getting weird “special effects” or “style designed” cymbals if your budget is limited. Look for a good ride cymbal, a couple of crashes, and a great set of hi-hats. You can add to your collection later, but use this as a starting point. What company makes the best cymbals? To be honest, all of the major cymbal companies are making great instruments. And they all offer a large variety of cymbals to choose from. So I say, “Play what inspires you.” I personally prefer HEARTBEAT cymbals. But I am also aware of what the other manufacturers are making. I just happen to be very happy with what I’m hearing from HEARTBEAT. Here is what I look for in a “general purpose” set of cymbals. They have to sound good in all the styles of music I’m playing so they can’t stand out individually or have a tone that is identified with a certain style. For instance in jazz the cymbals are often lighter and sound dry and dark. In rock music they are usually heavier and sound cutting and harsh. That’s not always the case, but just a general reference. So in my “all purpose” set up the cymbals are a medium to medium thin weight. And the sizes are what would be considered the current standard. A 20” Medium Dry Ride, 19″, 18” and 17” Medium crashes, 12” & 8″ splashes, an 18″ medium china and 14” Medium Hi-hats (sometimes 15″). ***A standard package would just be a ride; 2 crashes; and hi-hats. I often just use that set up with variations in types of cymbals. I mostly use the Custom & Studio series from Heartbeat, but I also have a set of the Classics; very similar to the classic A series from Zildjian. You could probably compare that to the AA series from Sabian or the Signature line of Paiste cymbals. All of these models are the top of the line for each of the companies I mentioned. And along with that comes the top of the line price. When buying cymbals you can not cut corners. I recommend buying fewer pieces and getting better ones if your budget is tight. When buying drums you can spend a little less money and still get a great sound with good heads and proper tuning. Cymbals are a whole different story. So with the set up I’ve listed you could easily spend $1000 or more. To save money you could buy used cymbals but be sure to test them and inspect them carefully. Hold them up to a light and look for any small cracks. Also look for sales at your local drum shop or shop on line. 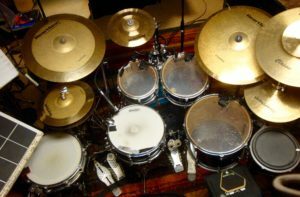 There are some great web sites that have tons of drums and cymbals to choose from. Take your time and don’t feel pressured to buy. If this adventure is new for you ask the salesperson to show you a large variety of cymbals to try out. Most drum shops will have a room where you can play every cymbal that’s for sale. If a store will not let you test cymbals don’t buy from them. *You wouldn’t buy a car without test driving it. But don’t abuse the privilege either. Once you’ve played a cymbal for a while move on to another. You should be able to hear pretty quickly what sounds you like or dislike. So what are we listening for? We want to find a set of cymbals that sound good as an ensemble, not just great individual instruments. I play a cymbal all over its full surface. I hit it on the bell, on the edge, and every where in between. I’ll tap soft rhythms and then build into pretty hard “slices” across the edge to hear how it sounds as a crash cymbal. Yes, even on the ride cymbal! When I hit a crash I’ll let the sound decay as long as possible and listen carefully to how the tone fades. It should have a smooth, shimmering decay. If it sounds like it’s flanging or making a wave tone I’ll try something else. When playing “ride” patterns, does the cymbal maintain good stick definition or does it start to “wash” out? Crash cymbals will probably do that anyway, but I try to find at least one that could be used as a ride cymbal too; maybe the 18” crash. Ride cymbals should definitely stay controlled. They should flow with the intensity of your playing. If you love the tone of a ride but it wants to wash out too soon you could put a little tape on it. I’ve got a couple like that; they sound great but I had to put a little tape underneath to “dry” them out a bit. Once I’ve found individual favorites I’ll set them up together. I’ll play patterns on the whole set and listen carefully to see if they sound great as a group. You should notice very distinct pitches. Ride to crash; splash to crash; top hi-hat to crash, etc. etc. I try to hear a broad range of tone from the set. I especially choose crashes the have very different pitches but similar timbre or character. As the sounds fade I’ll listen carefully for an “odd” tone; a sound that just doesn’t seem to fit with the other cymbals. Sometimes you have to try a different crash, or splash, or even a ride cymbal. I know this is an art and it takes time to learn. Just be patient and you’ll get the hang of it. That’s why it’s probably a good idea to try cymbals from the same series when you first do this. But after a while you’ll be able to mix and match cymbals according to what your ears are hearing and not by what you’re seeing. Even with the best design and manufacturing processes, each cymbal is unique. The same models may be very close, but there are always subtle nuances that I think make each one an individual voice. When mounting the cymbals, be sure the plastic sleeve is on the stem of the cymbal stand. This cushions the cymbal hole and protects it against grinding. Also check the base plate on the stem. If it’s curved, make sure it curves downward. It’s supposed to match the shape of the bell of the cymbal. And last but not least, be sure the felt washers are in place on the bottom and the top of your cymbals. All of these elements affect the tone of your cymbals. Don’t tighten the wing nuts too much either, or you can even leave them off. Crashes and splashes have to move freely to get the best tone. Ride cymbals can be a little tighter to control the tone if you’d like, but the general rule is to “let them breath.” Even the top hi-hat should be able to wiggle so the tone is not choked. It only needs to be tight enough to track properly with your foot action. The angle of your cymbals is also important. No matter what height you place your cymbals, angle them to point toward your chest. This will line them up with the motion of your arms and wrists. When crashing your cymbals, use a “slicing” stroke. Do not hit straight on the edge of your cymbals. They will not hold up under that kind of stress. Of course drummers are always changing this and trying other methods… but I feel for tone, ease of playing, and “health of the cymbal” this approach is preferred. All of these guidelines should give your cymbals a long life. When making this kind of investment, you’ll be glad you followed these general rules. Over time, I’m sure you’ll want to add to your collection. Maybe another crash or splash would be nice. Whatever cymbal you add, be sure to do the same testing method. I use to take my ride and two crash cymbals with me to test the new one along side them. Now my ears can pretty much hear a cymbal to identify its character and tone enough to get a good match. Remember though, this is still an art form. Don’t hesitate to try different types of cymbals to expand your musical palate. A good set of cymbals will be a key element to your sound. As I said before take your time and choose carefully. Blessings to you and good cymbal hunting. URGENT UPDATES: 1. Only use headphones or “in-ear” monitors to hear your mix. NEVER use speakers in a booth or behind the shield: It WILL destroy your hearing! 2. The drums MUST be miked, even if you only use a few panels. /////// If drum volume is just impossible to control in your venue a drum booth maybe necessary… as a last resort! First, try to play to the room more… (*read my other article about this.) …adjusting your dynamics etc. etc. But if all of that has failed, then build a booth for your drums or order one from the ClearSonic company (www.clearsonic.com) or Phoenix drum enclosures at http://whiteleysolutions.com/. If necessary you can totally enclose the drums. You can match the color & décor of the auditorium and everyone will be happy with the sound AND the look. When using a shield or a booth be sure to make it large enough so you can still walk around the drums. It should also be at least two feet higher that your highest cymbal. 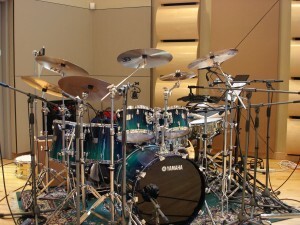 A drum kit must “breath” or move the airwaves freely to sound its best. If the booth is too small the drums will sound choked & harsh. As an example: Test this by holding your hand in front of your mouth while you are speaking and then gradually move it away. Notice how your tone sounds warmer as you allow more space between your mouth and hand. Drums have a similar response in a booth! There’s no use putting up a small shield. It will only cut down 5% to 10% of the decibel level. If you go to all of this effort do it completely. You can start in phases. Maybe begin with just the front panels. Add the back to it if that’s not enough. Then the last step would be a top if necessary. 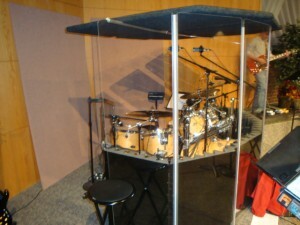 **The photo shows a pretty common approach to drum booth set ups. Not bad really, except that the kit is too close to the glass for my liking. It needs a little more breathing room. If needed they could add more panels and totally enclose the kit, but it wasn’t needed for this auditorium. I always prefer playing to the room without using a shield, but I’m flexible and can work in both situations. As always, the main thing is to serve the team and do what works best in each setting. Wow, I was so blessed that the guys at worshipdrummer.ca put my Worship Grooves DVD on there Christmas list. 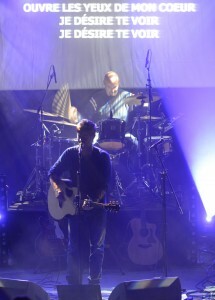 http://www.worshipdrummer.ca/gift-ideas-2011/ There’s still time for domestic orders to make it before Christmas. Get your shopping done now. Such great deals on all my DVDs. You can afford one more present for your drummer OR yourself. 🙂 $10 each for everything in my store!! Happy Holidays & Merry Christmas everyone. Can someone tell me just how many snare drums it takes to make a drummer happy? I wish I knew. About the time I think I have all the snares I need a new sound will hit me in the ears. Maybe sounds hit us in the soul too. Either way, I am constantly listening for new snare drums that should be added to my arsenal. In reality I think a drummer’s collection of “working” snares could be complete with about six different drums. I can do almost any job in a session or tour with these essential snares. 1. 14” x 6” brass shell snare – like Yamaha’s Classic Brass or a Pearl Free-floating brass shell or a Ludwig Black Beauty. 2. 14” x 5” maple shell snare – Yamaha Maple Custom Absolute. 3. 14” x 5” aluminum shell snare – like a Ludwig Acrolite or similar model. 6. 14” x 6 ½” chrome over brass Paul Leim Signature Snare by Yamaha, similar to Slingerland’s chrome over brass or Pearl’s old Jupiter Snare. I actually have about fifteen snares. Not too many really, considering I can think of drummers I know that have thirty or more. Each drum has its own character and tone. That is the reason we drummers are compelled to keep buying them. Some drums I get at a shop after checking out dozens in the show room. Other drums I’ll find at yard sales. Still others I’ll get just because I’ve heard them used by other players and I want to add that sound to my collection. It’s true that the design of a drum creates its own unique tonal character. The size of the shell; the material used; the thickness; the rims; the hardware; the snares; the heads; and the cut or shape of the edges will all affect the sound you hear. As players we usually don’t consider why something sounds the way it does, we just like or dislike what we hear. “It’s a feel thing.” And that’s perfectly OK! Trust your ears. I always advise drummers to play what inspires them. You may feel that you have no idea where to begin. Maybe you just want one drum to do everything. In all fairness, that is a tall order for one snare. If I had to choose only one drum for a tour or recording I would probably go with the 14” x 6” brass shelled snare like the Yamaha snare, Pearl Free-floater, or Ludwig Black Beauty I mentioned earlier. I use all of these drums with standard steel hoops, not die-cast. And the producers, artists, and bands always like what they hear. No kidding! All of the sessions I did in the last two weeks I mostly used one of those snares. Paul Baloche’s entire “Offering” recording was a Ludwig Black Beauty with a Peavey 1000 maple piccolo snare to the left of my hi-hat. On the latest tour I’m using the Yamaha brass shelled drum. Again, on different songs I’ll try different things. But I usually begin with the brass drum. The sound of a brass snare is awesome. Brass is a heavier metal so it projects some warmth that steel does not. Because it is metal it has a brighter tone to it than wood. Also by changing the tuning and muffling of the drum you can make it sound really fat and low, or crank it up and make it really “pingy”! It’s probably the most versatile drum in my collection. Now I know there are drummers reading this who might disagree with me. That’s OK! Again, I encourage you to play what inspires you. I’m just trying to narrow down all of the options into one workable snare drum. And so far the brass drum has always come out the winner. While working on a project I may use a different snare for each song. That really does happen. But when there’s no time to change I’ll always set up the big brass snare. As a secondary snare I usually use a 14” (or 13”) x 3” brass piccolo snare to the left of my hi-hat. That again is a starting point. According to the music I might switch things around. I’ll put the piccolo in the primary position and the bigger drum to the left. It’s always a creative musical choice. Head choices for this set up are as follows. I’ll use an Evans Reverse Dot Coated head on the bigger drum and a Coated G1 on the piccolo. The standard Snare Side Evans Resonant is on the bottom of both drums. If I want the piccolo even brighter sounding I’ll put a thinner head on top. Again, if you like different manufacturers use what inspires you. I’ll tune the bigger drum pretty tight, but not like the piccolo. With the snares turned off tap the center of the drum. The note you should hear should be around a “G”. If you want it a little brighter tune up to an “A”. I’ll tune the piccolo much higher. I crank it up to a high “C”. I even tune my snares in perfect 4ths or 3rds; never closer than a minor 3rd. It’s always a creative choice. Actually some of the signature drums being made now are really amazing. Paul Leim’s Yamaha snares are incredible. 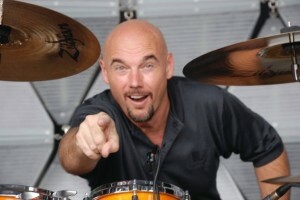 Pearl’s Steve Forrone snare; Tama’s Kenny Aronoff snare; and Yamaha’s Manu Katche snare are also great drums. It’s no surprise I like all of these drums. They’re designed after the Ludwig Black Beauty brass snare with some variations. Paul’s drum has the chrome over brass element. Manu’s snare as well as Paul’s come with die cast hoops. These hoops give a snare more “crack”. All of these drums have that same classic brass character. The others are almost exact copies of the Black Beauty. For you Steve Gadd fans, after years of development Yamaha finally came up with a snare that Steve loved. His classic Ludwig “Supra-phonic” sound has been duplicated by Yamaha. For years Yamaha made the rest of his kit, but Steve always used the Ludwig snare as his primary drum. Their design team really nailed it with this drum. They even make it in six varieties of different sizes and wood shell models too. Of course if you want that sound you could just get the Ludwig Supra-phonic like he always used. The world of snare drums is constantly growing. In every issue of Modern Drummer you’ll find new designs and even independent builders coming up with fresh concepts in drum building. The Craviotto Drum Company is just one that makes fantastic snare drums. Chester Thompson allowed me to check out his maple snare that they made. It had amazing “crack” and tone, and a very distinct character of its own. A drum I would like to add to my collection one day. This seems to happen a lot when I hear new drums. Musicians are like musical chefs always adding spices to their cabinet. I have to admit I have quite an appetite. No matter how many drums you own, get to know what each one will do. I’ll spend time playing each snare to get use to its unique sound. I’ll tune and adjust them in different ways to discover a variety of colors in each snare. That way when I’m in a session or on tour I am able to actually hear the sound in my mind without going through my whole collection to find the right “spice” for what I’m cooking up. It is great to experiment as long as you’re not wasting other people’s time. The snare is probably the most distinct drum voice we hear in music today. So having a good understanding of the options available is very important. Start with a few essential drums as we’ve discussed. As time and money allow keep adding to your own personal collection. Listen, read, and investigate so you will be able to serve up quite a tasty treat for your fellow musicians. A good chef knows what flavor he wants to add to a recipe to make it unique and wonderful. It won’t be long before you know how to add just the right snare “spices” to your own musical menu. Drum warm-ups on the road. Even when you’re on the road you have to practice. Here’s a little warm-up I do when I travel. OK, drummers, here’s the deal! Most people don’t want to hear a fill every two bars. They don’t care how hard you’ve practiced to play those 32nd note patterns or to “nail” the solo from your favorite drum recording. They just want you to PLAY THE SONG! Keep the tempo steady, and play the tune the way you hear it on the recording, AND THAT’S IT! **The bold letters mean that I’m shouting… Oh, I’m sorry,,, I mean,,, speaking with a strong emphasis. Actually, I’d pull my hair out except that I shave my head now and have nothing left to grab. Why is it that so many drummers don’t get this? … It is a mystery. You may have heard me say this before but it’s worth repeating. I always tell my students and clinic attendees to “Play music, NOT drums.” Serving the song and your team is your primary objective. If you think those things are suppose to serve you and give you a way to show-off your “sweet drumming skills” you’ve got it all wrong. Gosh!!! Now I know I’m making a big deal out of this, but it IS a big deal. Making the song sound great is EVERY musician’s job. If that is your heart about being a drummer people will love your playing. If the music calls for a lot of activity then go for it… but if it’s just playing grooves for tunes, then master that skill as well. Every great drum icon I’ve seen & heard made the whole band sound fantastic. Especially working with singer/artist types they always play for the song, and it is a magical experience. Drummers often think that their drum hero must be very restrained in their ability to just play songs. “They must be bored out of their mind! … I wish they could really cut loose!” But, you know, the “regular” people listening never think of it like that. The non-musical folks are just enjoying and experiencing the music. So, how do you keep from falling into the “busy drummer syndrome?” The first thing I do is just copy what has already been done. Listen to the original recordings and just do what they do. It’s that simple. And yes, SIMPLE is usually the operative word. Most songs are arranged very carefully. Check out any of your favorite artists or worship recordings and you’ll hear what I mean. Intros, verses, choruses, etc. etc. all seem to have specific musical ideas happening. Play it just like that. Yea, I know, you’re thinking… “But Carl, that’s sooooooo boring!! I want to add some flash to it; put some of my own personality into it! Man, I’ve got to express myself!” Arghhhhhhhhh! Get over this attitude as soon as possible. Express yourself at home! Blow off that creative drive during your practice time. Otherwise, just play the songs. Doing a great job IS expressing yourself. It is the most mature thing you can do as a musician. Making great music and bringing the songs to life is what it’s all about. There is not one artist that I’ve worked with that doesn’t feel the same way about this subject. Another way to battle this illness is to talk to your worship leader or music director and ask if what you’re playing is working for them. If you’ve started with the recording as your reference they’ll usually like what you are doing. But there are times they do want a little more activity just to add energy to certain songs. Don’t get carried away though. This is not permission for you to become a “drum monster.” (You know, the big creature stepping on everything that gets in its way.) Yes, you must ask them. Sometimes people are afraid to talk to you about your playing because everyone knows how sensitive musicians can be. Recording your rehearsals and performances is also a great tool. Video tape it if you can, but do something so you can go back and check out how it went. Be honest with yourself and make note of both your great and bad moments. Let others review your recording as well. Then change anything you need to in order to make your performance even better. Finally, practice groove ideas with a click track for eight bars without any changes. Only do fills at the end of an eight bar phrase, and then maybe go to a variation of the groove for the next section. Do not even do fills in the 4th measure. This is an exercise in restraint. Not physically difficult, but it can be a real mental challenge. Do it! Listen closely to how consistent you are with EVERY element of your playing. Do the snare hits sound exactly alike? Is your hi-hat pattern maintaining a steady pace? Does the bass drum perfectly line up with your hands and sound solid? Put your playing “under the microscope” and perfect every element to the best of your ability. OK, so you say you’ve heard it all before.— Great. — BUT,,, are you doing it? Are you really honing in on your musical artistry? Do not become complacent or rest on yesterday’s accomplishments. Keep moving ahead. Improve what talent you already have. 1. Copy the drummers on great recordings. 2. Ask for honest feedback from those you work with. 3. Record yourself all of the time and review it. 4. Practice the 8 bar phrase concept with a click. Playing simple great grooves is NOT as simple you may think. It takes a strong, mature player to do this. But the pay-off is amazing. The whole band is going to sound better. Your singers are going to love how open and spacious the tunes feel. And you should feel more confident and solid in your performance. Again, remember it’s all about the music. Play what’s right for the style of songs your doing and you’ll be honored amongst your peers. It was a powerful time of worship on Sunday with Chris McClarney’s team. Gabe Harris & I were so excited to lay down the grooves with TWO drum kits!